This dialog is a subdialog of the page 'basics'. If you want, you may not only enter the directories, but also additional information. First, you may name the involved computers with an image and a text. This data is only for your information and will be displayed in the synchronization process. The directory is the same you entered before. 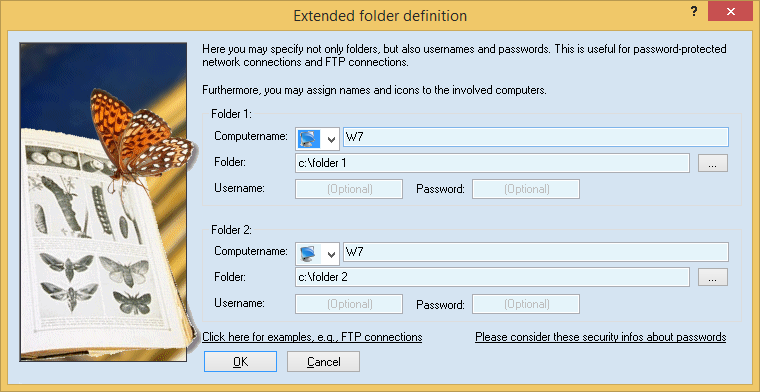 Username and password may be entered if the directory requires an authorization. This may be the case for directories in the local network. Note: Windows often supplies the right username by default, so it can make sense to enter a password, but not a username. But if you run Easy2Sync as Service (which normally runs under another user’s account) the network connection often requires a user name. If you’re unsure in this case whose name to enter, start the synchronization manually (and without name / password) and look at the username that Windows suggests in the dialog box. Note: If Windows doesn't accept your password, please read the article about Password problems.